506 Broadway When Joe Finocchio presented female impersonators on Broadway in North Beach in 1936, the police were not amused. They raided the place. Joe was undeterred and the landmark venue became a draw for tourists and celebrity visitors from all over the world. 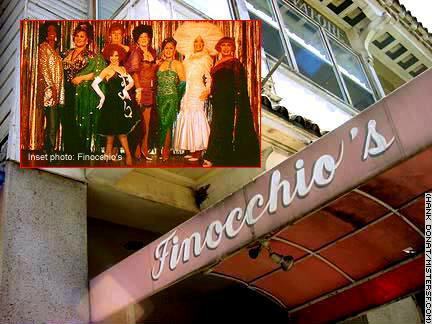 On Nov. 27, 1999 Finocchio's world famous revue closed its doors after 63 years and countless wigs, fans, feathers and false eye lashes. Veteran performers are quick to point out that they were not drag queens, rather they were illusionists, female impersonators hired for their singing and dancing talent. There was no lip-synching at Finocchio's. Mostly gays playing for a straight audience, these performers were on the forefront of gender politics in the U.S. The Finocchio family ruled the cast with an iron hand. Morals clauses were written into every contract, though drug use and moonlighting with Stage Door Johnnys was not uncommon. One salacious story from Finocchio's vet Ray de Young details his post-performance tableside visit with Victor Rothschild and his wife Vera-Ellen who danced onscreen with Fred Astaire and Gene Kelly. It was the mid-1950s. With V-E tucked into her Fairmont Hotel bed for the night, Rothschild returned to Finocchio's and offered de Young an apartment plus expense account to move to New York and entertain Rothschild privately at his discretion. De Young declined to be kept and refused to leave San Francisco with Rothschild. For most the of the venue's run, transsexuals were not hired. The Finocchio's wanted performers to enter the theatre as men and leave the theatre as men in order to further the venue's mystique as a house of illusion. Later, these policies were relaxed and eventually, biological women were hired to perform here.